This is a drawing of someone show jumping!!! I love horses and to draw them!!! 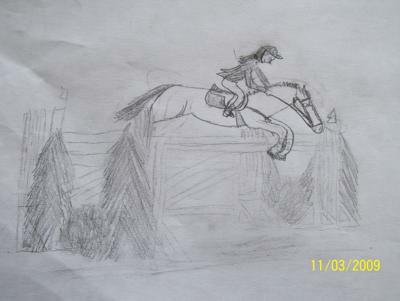 The horse and rider aren't very good (this isn't one of my best drawings) but the jump is really good!!! omg! that drawing is awesomely amazing! HI SHETEMA BFFL!!! Thank you!!! :D You rock to!!! What A Awesome Picture!!! Nicole yuu Rock !! And Remember Bffl !!! Best Firndz For Life! !